​We love to paint! Nothing refreshes a home like a fresh coat of paint. We have coated thousands of square feet of walls, ceilings, trim, decks and concrete. Many of our clients have enjoyed adding interior painting to the scope of work on their remodel because we make it easy and it just makes sense. First, it will reduces your liability as the owner. We're already on the job doing great work so you won't have to deal with finding another contractor just to paint. Second, there are no scheduling issues because we are doing the work. When the job is ready for paint. We paint! Third, you can write one check and deal with one person for all issues and concerns... me. I am all about making life easy as possible. There are many frustrations and complications in life and I don't want to be one of them. When a client first decides to pursue us doing the paint I will send them out to either Sherwin-Williams or Benjamin Moore to pick out colors and which products will work the best for each individual application. Between me and the experts at the paint store we will have you at ease that you are using the correct product to provide you with a beautiful lasting application. Once the paint products are chosen, mixed, and delivered, it's time for us to go to work. We will cover and protect all surfaces not receiving the new coatings. We'll prep the surfaces, tape everything off, fill small holes and caulk. Then typically we will roll one coat of a bonding and blocking primer followed by two coats of paint. 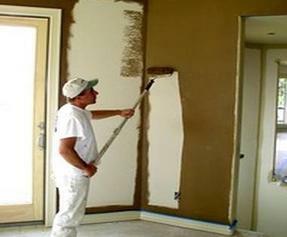 Know that if your situation is very complex and requires expert level service, we have a Master Painter of over 30 years experience available to refer the job to without skipping a beat. Some situations you want a true coating expert to be involved in and we've got you covered there too! Whatever the job we can make it happen.